Paella in Spain takes on many styles depending on the region of Spain. 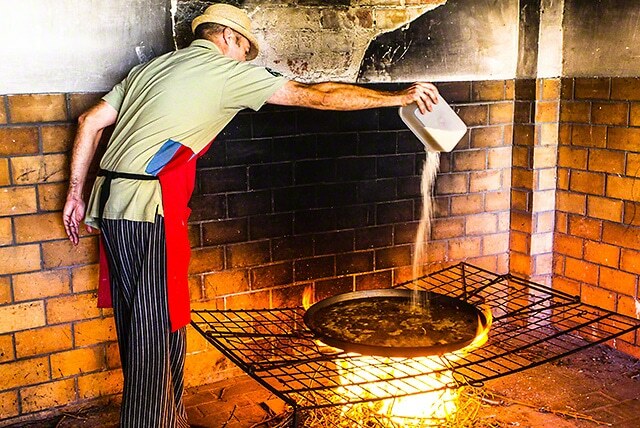 Even within a region, Paella is made in various ways. 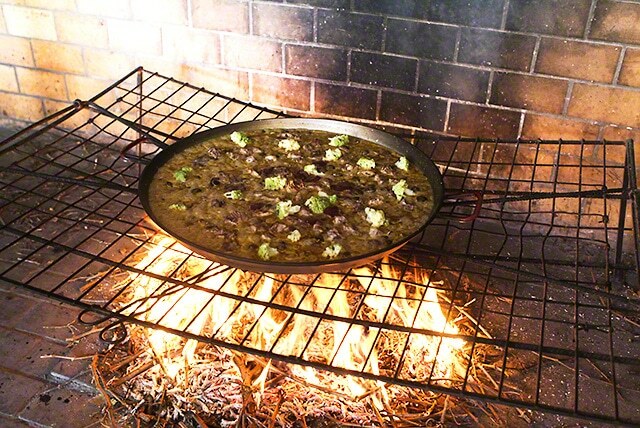 This Paella de Catalana is the specialty of Roger Felip Ibara, chef & owner at Mas Trucafort, a B&B and restaurant in the village of Falset in Catalonia. The recipe for this special Paella can be found in the cookbook, Rustica: A Return to Spanish Home Cooking ” The one common element in every Spanish Paella recipe is Spanish wine. 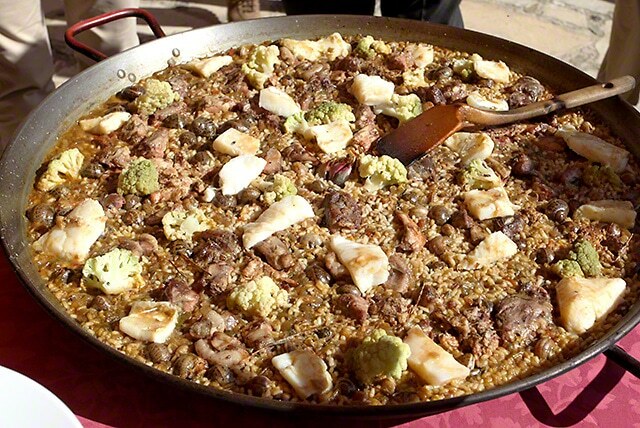 The Paella is traditionally served with the wine from that particular region. In this case, when the Paella was served to us, we had a selection of Priorat red wines to drink. What a feast! Roger used a special rice to prepare his Paella. It is only available in Catalonia. One can substitute Bomba or Valencia rice. He also collected snails from his garden to add to the Paella ingredients. Interestingly, Roger did not add the spice Saffron to the Paella dish. Saffron is an essential ingredient in Paella dishes. The one thing that made Roger’s Paella unique was the smoky flavor. As you can see from the photos, the Paella was cooked on a screen, and the fire was fueled by vine prunings. This was done inside a small structure with smoke filling the area. The smokiness made its way into the Paella dish. Selecting wine that pairs with Paella is an easy choice. A medium-bodied red will always work with traditional Spanish Paella. The Spanish Chorizo used in many Paella dishes is mild in spice or heat. 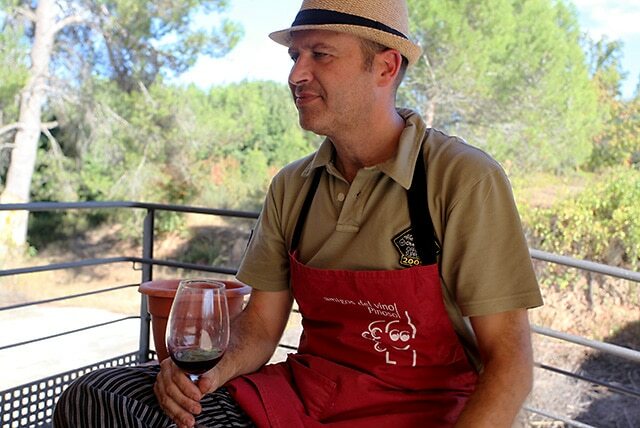 A good Tempranillo is our favorite with Paella. If the Paella is totally fish based or vegetarian a white wine like an Albariño is an excellent choice. A light Garnacha is also a perfect match in a red wine with a fish Paella.